This morning I went to see my sister off at the new terminal of Changi Airport. 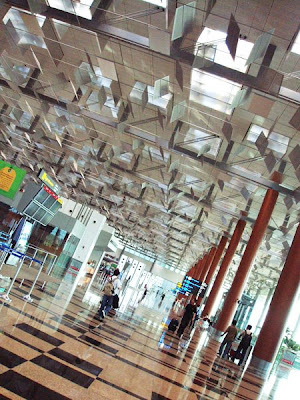 Terminal 3 opened on Jan 9th this year, cost about $1.75 billion to build and it's beauoootiful! The lobby is vast, guess they spared no expense despite the limited land resources. It's like a giant mall with fountains. 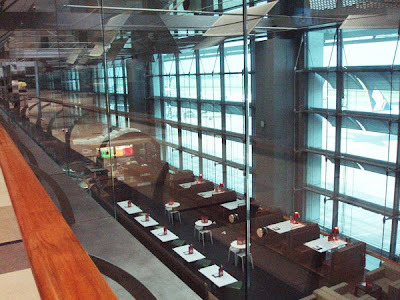 Many shops line the terminal, the viewing gallery has bars and restaurants so you can eat and drink while watching planes fly! There is a hypermart and a food court in the basement. I've always enjoyed airport visits especially when I was a child. 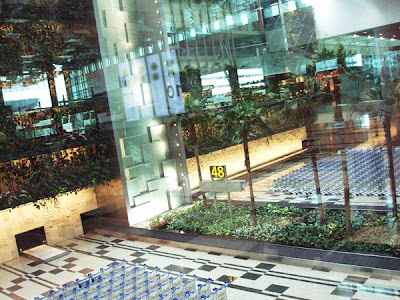 Back then we only had Terminal 1 and I recall how my eyes were glued to this cool fibre-optics fountain that spans from basement to the top storey! 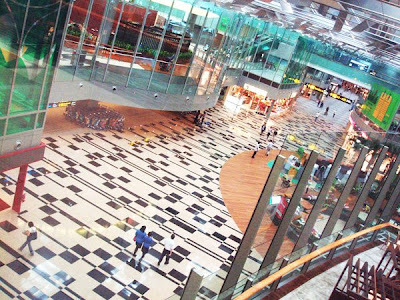 During my teen years, it became common for students to head off to the airport to study on the carpeted floors (viewing gallery) because of the quiet ambience and air-con (what else lol). Main lobby with lots of natural light streaming in. A cascading waterfall and creepers on the wall. 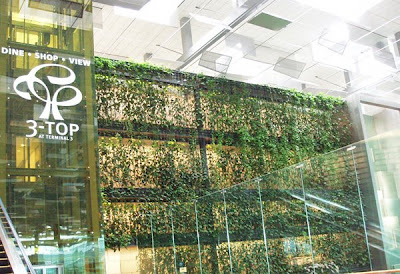 The cascading waterfall is designed between the conveyer belts and bromeliad plants in the center with palms. Shopping and food, just a portion of it on the ground floor. Viewing gallery with restaurant below. You can spot the reflection of the bar on the glass! I'm on 3rd storey looking down at 2nd storey. 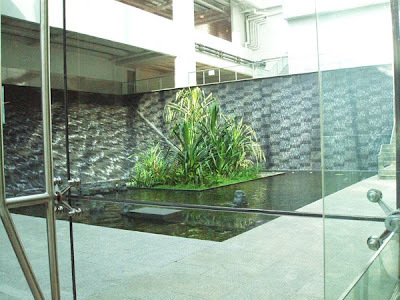 Wall fountain garden at basement 1, leading down to the train station below. Very cool airport! I like how you said that students would study there for the calm and quiet! Very cool!